Slovakia’s Peter Sagan, wearing the best sprinter’s green jersey, right, crosses the finish line ahead of Norway’s Alexander Kristoff, center, and France’s Arnaud Demare, left, during the 13th stage of the Tour de France on Friday. The Stage 13 victory was the third stage win of the Tour for Sagan. 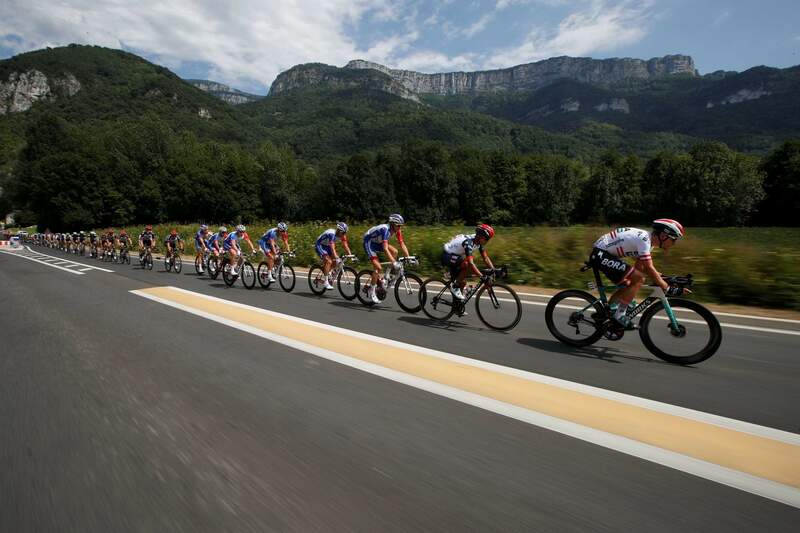 Friday’s stage covered 105.3 miles, with its start in Bourg d’Oisans and finish in Valence, France. 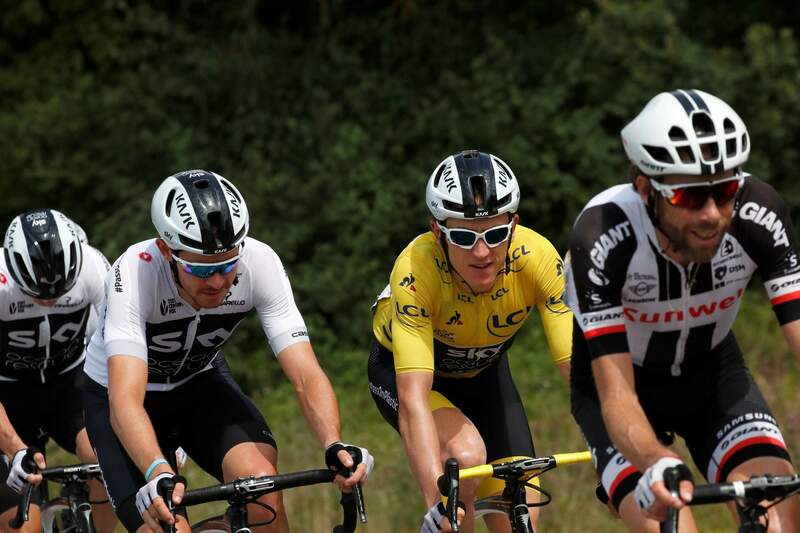 The pack with Britain’s Geraint Thomas, wearing the overall leader’s yellow jersey, rides in the 13th stage of the Tour de France on Friday. The stage covered 105.3 miles, with its start in Bourg d’Oisans and finish in Valence, France. Austria’s Lukas Postlberger, right, is followed by Colombia’s Jhon Darwin Atapuma during the 13th stage of the Tour de France on Friday. 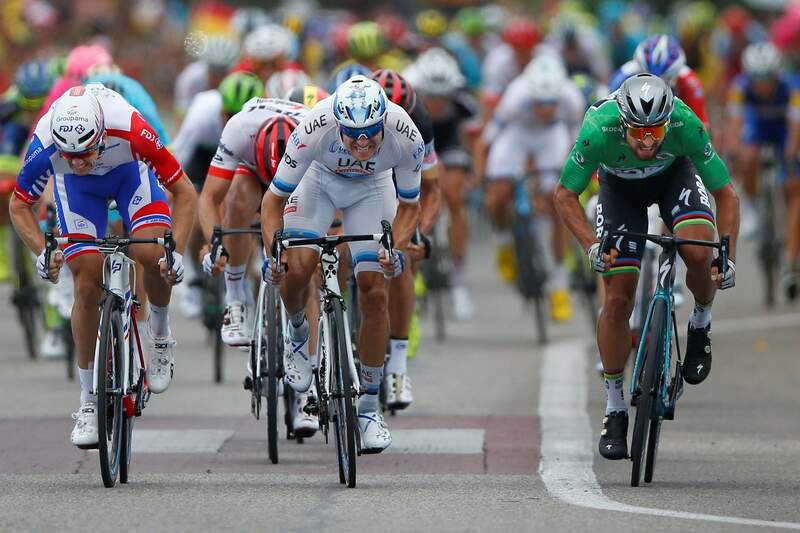 VALENCE, France – After most of the other top sprinters at the Tour de France succumbed in the Alps, Peter Sagan was in prime position to dominate Friday’s flat finish. Cycling’s world champion did not disappoint, timing his move to reach maximum speed as he swung past two challengers to claim Stage 13 by a wheel length and take his third win of this race. Seconds after Sagan reasserted his status as the most feared finisher left on the Tour, overall leader Geraint Thomas safely crossed in the pack along with teammate – and nearest challenger – Chris Froome. After overzealous fans marred Thomas’ win on Thursday atop the Alpe d’Huez, the otherwise complete calm of Friday’s leg was briefly disturbed by a man on the roadside who tossed a smoke bomb into the center of the peloton as it passed by with 10 miles left. Thomas said he didn’t see the smoke bomb, which, besides spitting out yellow fumes, appeared to do no harm. As for the jeers directed toward him and Froome by fans skeptical of Froome’s clearance from doping allegations days before the start of the Tour, he said it was part of being in the spotlight. “I would rather be on the podium and be booed than be on the bus and have everyone cheering me,” Thomas said. Thomas did ask for fans to not interfere in the race after Froome was slapped on the back going up Alpe d’Huez and contender Vincenzo Nibali was forced to quit after he broke a vertebra when knocked to the ground by a police motorbike tasked with keeping back the crowd. The 105-mile leg starting from Bourg d’Oisans at the foot of the Alpe d’Huez delayed the resolution to the burning question of this race: Is Thomas really Sky’s top option while Froome seeks a fifth Tour title? “We’ve got two cards to play and it’s good for our strategy,” Sky sports director Nicolas Portal said before Friday’s stage. Saturday’s Stage 14 is a hilly 116.8-mile trek from Saint-Paul-Trois-Chateaux to Mende as the race makes its way to the Pyrenees Mountains. And Froome seems eager for the action to return. “Tomorrow we can see some good battles between the favorites,” Froome said. Associated Press writers Andrew Dampf and Ciaran Fahey contributed.